Like most large family moms, I spend about half my day (everyday) thinking about food and meals and grocery lists. It can be an exhausting aspect of running a large household but it offers many lessons in being prepared and organized. Of course there will be days when activities consume the day and meals are difficult to prepare. There are also days when one or more family members is sick and meals are difficult to get on the table. Ya'll I am the first person who LOVES a greasy fast food burger, seriously, but I really do try to eat healthy and I haven't the cash to be buying burgers for 7 kids at a whim. Prepared moms have a plan, and after a few hours of work yesterday I am once again a prepared one. This book does have casseroles, but it also has food such as Sweet Asian Chicken. This meal consists of chicken pieces frozen in a homemade marinade that, once thawed, is cooked as a stir fry you can eat over rice. I also made Pecan Crusted Chicken. This dish is again chicken frozen in marinade. The instructions include a separate bag to freeze that contains a special panko and pecan breading to roll the chicken through once thawed. The result is a delicious crispy baked chicken strip. Of course those two examples require a minimal amount of preparation for a home cooked meal. For days when I just have no time at all I did prepare a couple of casseroles. I made lasagna (my kids' favorite), chicken enchiladas (my favorite) and a chicken-broccoli bake that is served over rice. A new recipe I also made consisted of making and pre-baking Salisbury Meatballs that have been frozen with a made from scratch Salisbury sauce. Once thawed it can be reheated in a skillet and eaten over mashed potatoes. Finally, I decided to prep for quick lunches, especially for Journee, who is working 2 jobs and attending school full time. I cooked up refried beans and seasoned ground beef to make 30 bean and beef burritos. These are wrapped individually and ready for a quick heat up. You will not find any cream of soups in this book either. All of the sauces are made from scratch and are simple. There is also advice on exactly how to organize a grocery list for this type of bulk shopping and meal prep. I chose foods that can be eaten with rice because I have a rice cooker. Families need rice cookers! It is an absolutely easy way to cook wholesome rice without making a mess and it is very quick. Rice in bulk is inexpensive and versatile. Rice cookers will also keep the rice warm after cooking, so you don't have to be perfect in your meal timing either. A few hours of kitchen time resulted in 18 entrees and 30 burritos. This will be a great supplement to my weekly meal planning, and on hectic days I know that I have meals ready to go. Of course I now have the task of organizing my freezers and making sure I have everything where I can see it. 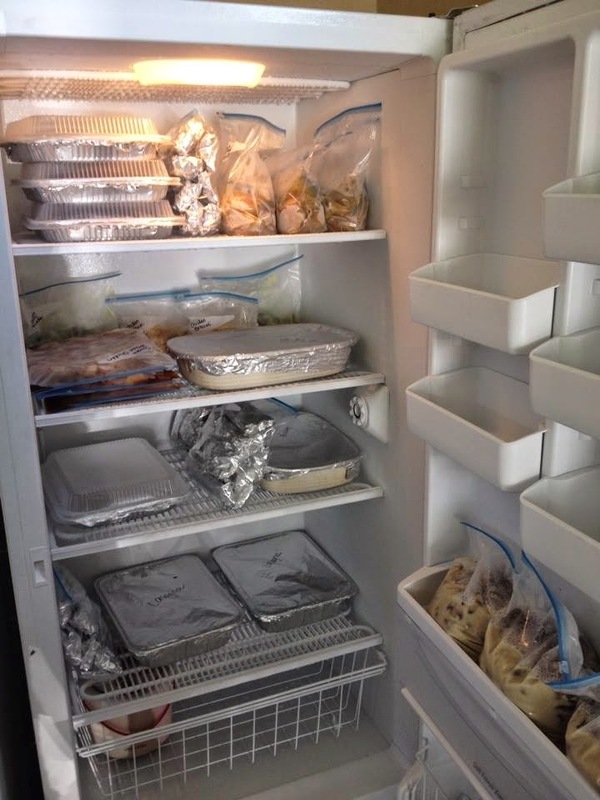 This picture of my freezer is just what I made yesterday, but I still need to pack my roasts and chickens back in the space. My morning should be interesting. Now all I have is to finish going through school books that arrived via my favorite brown truck yesterday. I have that same upright freezer! But mine does not look like yours. Alas I have not defrosted it in 2 years and the ice build up is terrible! I need to do that before I fill it anymore! 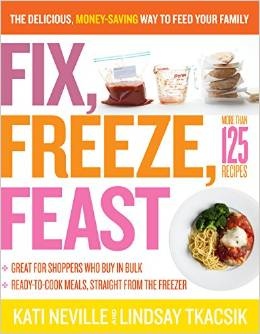 Note to self: Defrost freezer, then make these awesome meals!! Thanks for sharing!